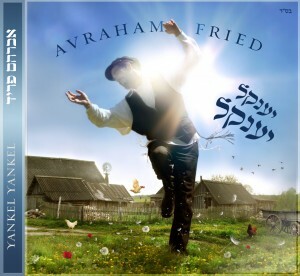 Brand New CD from Avraham Fried – Cover Released! While there are many Chassidic niggunim albums, and a fantastic number of Chabad niggunim albums*, none has made the impact on the general Jewish music world that Avraham Fried’s highly successful series of niggunim albums. So it was with high expectations that I picked up Yankel Yankel. My thoughts? Well, bear with me – as listening to this album over the past few days has brought many thoughts to my mind, both about the skill and artistry of Avraham Fried, as well as about the niggunim he presents before us. *Can you guess how many artists have produced a Chabad niggunim cd? Answer – based on my calculation – on the bottom! In producing his niggunim albums, Fried had two goals to accomplish: 1) Bring niggunim to the mainstream crowd, and 2) attempt to keep the highly sensitive and spiritual side of the niggunim intact. Considering the delicate balance of many variables, a difficult task indeed. This album is closest in style to Avinu Malkeinu, but with a few variables – it seems to me that there are more vocal arrangements going on here than on Avinu Malkeinu. In any case, it works out very nicely. The selection of niggunim is excellent – balancing all sorts of styles – the deep, the whimsical, the leibidik, etc. The theme of the album is, as Fried makes clear in his liner letter, hope. (No, this has nothing to do with Obama.) It does come at a time that many of us are struggling, with little in terms of leadership and inspiration. The Rebbe writes that a Chassidic niggun can bring “faith, joy and light” into a home – and it is quite apparent that this was Fried’s focus. There are at least 6 niggunim on this album that directly deal with hope, and the breakneck pace of the joyous niggunim have a certain taste that leads me to humbly believe that this was the inner intent to them as well. (*** ) Track 1 – Baruch Hu: This niggun was until now virtually unknown. It sounds klezmer/folksy – I can easily imagine Theodore Bikel singing it. It has a light-hearted feel to it in its simple tune. Avremi G excels here in his arranging abilities – he takes what otherwise would be nothing to write home about, and gives it a classy, beautiful frame that really brings out the best in it. Chabad Chassidus has a word to describe the internalization process we use to truly make something part of us – we call this being “mafnim” something; or bringing something down “bepnimius”. We want concepts to become part of ourselves, rather than remain aloof and sterile in their intellectual realm. I would venture that this niggun, with its repetitiveness (“Noch a mol, noch a mol”), is attempting to do just that. (****) Track 2 – Sholom Aleichem: A stunning tune, set beautifully to the words of Sholom Aleichem. This is one of the Alter Rebbe’s compositions, and it reaches deep into the heart, especially with Avremel and Co.’s vocal rendition. A word on the excellent liner notes: I had no idea that this was one of the Alter Rebbe’s niggunim, and I had never heard that the melody was adapted to Sholom Aleichem at the Rebbe Rayatz’s initiative. Fascinating – and I am very thankful to Avremel for the readable and interesting liner notes – as opposed to the boring notes on so many other albums. This really feels like Avremel is listening to the CD over your shoulder. One last comment about Sholom Aleichem – does Mrs. Fried let Avremel hit those end notes at the Shabbos table? Wow. I’ve always loved this nigun, sung in yeshiva with tens of other bochurim at late night farbrengens. We had always sung this nigun as each stanza repeated twice each, rather than as Fried sings them in the Sholom Aleichem version, and I don’t know which is the original composition. Nonetheless, I guarantee that thousands of families, Chabad Houses and camps across the world will be changing their Friday night repertoire over the next few months. (***) Track 3 – R’ Mendel’s Niggun: A rollicking nigun, sung with real gusto. Fried seems to get a kick out of this nigun, which is likewise not a very well known tune, by any means. The arrangement is once again, really nice – the hora beat gets you moving, and the percussion, specifically, is classy. (****) Track 4 – Yiddish Medley: Avremi G. did a great job with the medleys on this album. They are, for the most part, seamless and natural, and don’t get boring. There’s a certain progression that you feel building up, rather than a bunch of songs almost randomly tossed together – as on so many albums. This album has a funny quirk in that its lead song is just one number in a medley (not even the first!) – I don’t think that has ever happened before! Fohrt a Yiddeleh: Before anyone has a heart attack on the message here, read the liner notes! Lubavitcher niggunim have many cryptic messages (how about all the songs about vodka, for starters), so don’t think this is prayer to the Rebbe! It’s a pretty song, although I thought the children’s choir was overreaching on the words “Mommenyu” and “Tattenyu”. Could’ve done without it. But Fried makes up with his powerful “Rateveh!” afterwards. Yankel Yankel: A fun and hopeful niggun. What else to say about it? It’s also fairly simple – it doesn’t have a high part. But the Yiddish words are straight and to the point. And Fried and Bros. do a good job of presenting it. Di Velt: Here’s the Yiddish version of Kol Haolam Kulo that almost no one knew existed. This is another fun niggun, presented in Mizrachi format. Great vocals going on, with tons of energy and feeling. I heard this niggun years ago from a shliach to the Crimea, Rabbi Itche Meir Lipszyc. He also taught us another version of the Yiddish – and whether this was added jokingly, or was originally part of the song, I do not know – “Un der ikkar – s’vellen shiker – und nisht tzu naar’n zich!” Approximate translation: “And the main thing – we’ll all get drunk – and let’s not mess around!” Getting drunk, both in Chassidic musical heritage and philosophical usage, refers to delving into the mysteries of G-d and His creation. The message here would then be to remember that whatever one learns needs to be applied to the world and to our service of Hashem within the world. One cannot think that his life in yeshiva is one thing, and his life outside yeshiva is another. Ober a Maaleh: This one’s a classic. It’s been a staple at Lubavitcher weddings and Simchas Beis Hashoeivahs, but now it’s getting its world debut. Check out the rocking arrangement at 6:15 – it gets new inflection and power, carried out with great gusto by Fried. And then we follow into the ending of the medley – the harmonic combining of three of the four songs together, along with the message in English, “Don’t give up!” which is easily one of the best endings of a song in Jewish music. Brilliant. Chassidim oftentimes sing the chorus of “Chotsh” with the replacement words: “Ad mosai/ Do we have to wait/ We want Moshiach now/ We don’t want to wait.” Just BTW. (***) Track 5 – Niggun L’Shabbos V’yom Tov: When I heard the opening notes of this niggun being sung, I was thrilled. This little-known but gorgeous tune is one of my favorites; one I can recall many late night farbrengens singing intensely with fellow bochurim. It still brings me to another world when I sing it. But yet… I was disappointed by Fried’s work on it – I felt that it’s a bit rushed, and that they tried to do too much with the arrangements and the choir. I think this one tune should have stayed as pristine as possible. They say that while recording Nichoach, the guys simply made a L’chaim in the recording studio and sang. I don’t know whether or not that is true, but I’d venture Fried could have done a better job on this particular niggun had he tried that simplistic and natural approach. The end of the niggun is performed beautifully, though. An aside: go ahead – try it yourself. Sit down on a shabbos morning during shacharis, tune everything out, and sing this niggun softly to yourself a few times, while thinking of your relationship with Hashem. See what it will do to your shacharis. (****) Track 6 – Niggun Simcha: Great niggun, better performance. The vocals really interact well on this fast niggun. This is one of the rare instances that the musical arrangements really don’t need to be that up-front-and-center, as the palpable energy of both Fried and the choir, along with good and natural harmonies make the song flow easily and fluid. And then you stick in the sax semi-solo (all five seconds of it), but to great effect. (***) Track 7 – Motzoei Shabbos Medley: It’s interesting that there are so many Chabad niggunim with words that aren’t part of our nusach. Neither of these zemiros are part of Chabad nusach. On a well-produced album, this medley (of two songs) is simply average. Hamavdil: A Chabad classic. While we don’t sing this zemer as part of the post-Shabbos tefillos, you will hear many Chabadniks singing this tune after Shabbos. I felt that it wasn’t given enough attention on this album – almost as if it is used merely as an entrance into Al Tirah Avdi Yaakov. It’s an extremely easy to sing niggun, and it has a certain Motzoei Shabbos flavor to it. Al Tirah Avdi Yaakov: This quasi-waltz has many points of a quintessential Lubavitcher niggun: the slow, introspective, serious side, and the leibidik, positive and exciting march. I wasn’t sure what to make of the two opposing sides, especially with the lyrics, but eventually I came to really appreciate it. Great moments begin at about 3:30, with high harmonies and nice brass, followed by soothing, humming harmonies in the return to the slow part. Once again, the niggun is ended with tremendous skill in the arrangements – great harmonies, the double claps, and the niggun being sped up – a natural progression, were one to be singing it with the gantzer mishpoche. (***) Track 8 – Krementshuger Berelach: This heart-rending powerhouse of a tune is another davening niggun. While Fried does an excellent job on this niggun, I gave him a lower rating in comparison with Andy Statman’s phenomenal representation of this niggun on Zalman Goldstein’s Chabad Classics 2. If I were involved in the arrangements here, I would have brought Statman aboard (as he was for Hupp Cossack and Baal Shem Tov’s Song) if only for a reprise. At the same time, this is an exceedingly difficult niggun to come across as convincing. It’s comparable in some ways to the Poltava Niggun on Avinu Malkeinu in terms of its depth along with sheer vocal power needed. ILast thought – thought that the fade out in the end was weak. (****) Track 9 – Tzvei Freilachs: Again, two rocking niggunim – the first an all-time favorite, and the second a “new” niggun. The arrangements here herald a bit of a return to the first two albums, in terms of the classic Jewish music sound, but the vocals and harmonies again take over the song. As for the second niggun here: I’m noticing a bit of a balancing act on this album between classic niggunim and the more rare stuff. This rare niggun has been put out just recently by Yoni Zerbib (a Mendi Gerufi clone) on his Chabad niggunim album called “Shamil”. While he does a decent job with it, Fried obviously has the talent, production and power that Zerbib does not, so it’s obviously trumped by this version. Nice niggun, good balance, good stuff. Bchiyas Haneshama: The first niggun here is a plaintive cry, detailing the descent of the soul into the body. You can call this “the Chosid’s Neshomoleh”. Avremel’s son sings sweetly here in a pretty, although simple, duet. Reb Moshe’s Niggun: Excellent choice – a highly underrated and overlooked niggun. Avremi G. stuck with parts of the original arrangement from Nichoach, which is kinda cute – especially since in that case, it works well. This niggun fits well musically after the previous one, but I don’t see how they work together conceptually. This niggun is another “toss away your worries” niggun; which is seemingly an opposing emotion to the heavy responsibility Bchiyas Haneshama calls for. If you’re not going to read into it like I am, you’ll enjoy it – again, tremendous vocal arrangements, and very pretty musical arrangements. But what’s the last little shout at the end? Is that a word, or just “Bum-tche”? Whatever it is, it sounds good. After I wrote this, Avremel kindly informed me that the words here are “On Shoin!” See the comments below. (*****) Track 11 – Finale Medley: One reason this album really flows well is because it gets better, rather than “wasting” its best song in the beginning of the album. And the finale medley really has some of the best moments on the CD. This is just an awesome medley. Nyet Nyekavo: A classic – performed with the authority inherent in the tune. When the fifth Rebbe of Chabad heard this tune, he said, “Dos iz a toihudiker Ein Oid! This is a chaotic ‘none other than G-d!’” As the Israelis would say, “Pitzutz! A bomb!” This is the anthem of the fight of the Russian Chassidim against the Imperialists as well as Bolsheviks. The rock arrangement fits perfectly. I was walking down the street one shabbos in Dnepropetrovsk, when a building caught my eye. There was some raw feeling that the building exuded – not a feeling that I can really explain. There was a certain… fear, something sinister, that hit me as I looked at it. Mind you – I was looking at the side of the building, not even at the front. So I asked my companion, a local guy, “What is that, a hospital?” His response: “Funny you mention it. That was the KGB headquarters, where the Rebbe’s father, R’ Levik Schneerson – besides for untold thousands of others – was held prisoner for many months.” I stood there dumbfounded – here I was, a fifth generation American with no personal connection whatsoever to the pains and fears of Soviet Jewry, yet somehow the evil that permeated this building hit me like a ton of bricks. And spontaneously, and with great feeling, I started singing this nigun. The mighty KGB stands no longer, and we, the frum Yidden, are there to dance over its decadence. Hoaderes: Walk into almost any Chabad shul on shabbos and you’ll hear this niggun. Performed just once before (by Piamenta, on 1990), here it gets a great update. A friend walked in while I was listening to this song and commented that he never had thought the song was that good until he heard this version. In shuls, it’s sung verse by verse, progressively getting faster. R’ Meir’s Niggun: Along comes an extremely geshmake niggun. (Thanks, Sholom, for reminding me to insert this here!) This is is actually one of the strongest tunes on the albums, and, as fitting for the excellent medley it was placed in, it has a very fun and engaging vocal arrangement. I particularly love the shouts of excitement placed throughout. Very appropriate, and it sounds great. This is such a singable niggun – I guarantee by its end, you’ll be singing along with it. Tzi Azoy: If you want a real creative version of this niggun, check out Mona Rosenblum’s Ne’imot Chabad/Chabad Melodies Vol. 1. When I first heard the niggun, it irked me how similar its chorus is to Nyet Nyekavo. Here, Avremi G. and Crew use it to their advantage, tossing it in the same medley. Again, Fried seems to relish the “Tzi Azoy, Tzi Azay” – there’s a lot of personality here. R’ Tuvia’s Niggun/High Note Niggun: While Fried calls it the High Note Niggun, I would call it the Syncopation Niggun. To me, this is the best spot on the CD – everything is in perfect sync. The vocals, the tune, the phenomenal arrangement each time through the tune. I love it all. Chasidei Chabad: And finally, a fitting ending song. While Fried inexplicably changed the lyrics (the original is: Besismat ufaratzta neleich be’oz/Im haRebbe neilech berosh/Chassidei Chabad anu/Chayalei HaRebbe Ashreinu. Translation: With the slogan, “Spread out!” we will go with strength/ With the Rebbe at our head/ We are Chabad Chassidim/Soldiers of the Rebbe, fortunate are we! ), his new lyrics are fitting for the (virtual) end of the album. You may notice the ending notes of the niggun Ashreinu just as the song goes into its last moments. Well done. (***) Track 12 – Birkas Kohanim: I love Birkas Kohanim. As the Baal Tefillah on Yomim Tovim in my little shteeble, I put a lot of emotion into this beautiful tune. So forgive me if I go on for a few moments about it. Firstly, for the children’s sake, they should have started a notch lower. Secondly, I don’t like Avremel’s intros to songs (Boruch Haba, Gott Fun Avraham). But besides that, if I were arranging this niggun, I would have tossed in three little extras here: firstly, the crowd answering “Amen” after each of the brochos; secondly, the mumbling of the Kehila saying Ribono Shel Olam during the last three words; and finally, a cacophony of “Yashar Koach Kohanim!” would have been awesome. Oh well. Tachlis: This is an excellent album. It has flavor, emotion, power, excitement and passion. Avremel and Avremi G. are an excellent pair; they’ve proven that quite clearly. While as a Lubavitcher I may feel that some of the niggunim could have been presented a bit better, at the same time, musically they’re wonderful – there just isn’t that much to complain about, and there’s lots to be uplifted by. This, my friends, is a worthwhile acquisition for your music collection. Others who have used a Lubavitcher niggun somewhere: MBD, Journeys, D’veykus, Lipa, Piamenta, The Baal Shem Tov Band, Yood, A Groyse Metsie, David Lazzar, RebbeSoul, Shlomo Gronich, The Klezmatics, Tzlil V’zemer, JEP, Matisyahu, Pirchei Ukraine, Yehoshua Rochman and probably many more. Tags: Avraham Fried, Avremi G.
BTW – a brief search on ITunes for “Chabad” or “Lubavitch” pulls up quite a few random niggunim done by very random artists. Some sound like they’re decent, some fairly awful. But it’s quite incredible how many niggunim have permeated the mainstream. 1)GREAT REVIEW!! I’m a “Classic Yeshiva Litvack” through and through and your little notes on each niggun are SO interesting. It’s really a world that I’m not familiar with and those notes add so much to the CD for me. Thanks a lot for the time you clearly put into this review. 5)Speaking of cryptic words at the end of a song. What’s with the “Rotz Katzvi” at the end of “Nyet Ntekavo”? 5)I hate to be a “nudge” but I’m very curious. Did you re-listen to/have any change of heart on “Tiher”? Thanks for the compliments! And you added some beautiful thoughts yourself. As for the “Rotz Katzvi”, that’s actually Russian: “Ras, dva, tri” – “One, two, three”. Sorry I forgot to include that in the review. :-p As for Tiher, I did eventually respond on the Fried article (although it took me forever), but it doesn’t do it for me. It’s just too long. I think that the reason I like some of Fried’s other chazonus pieces is because they’re in and out – a quick minute or two, rather than what amounts to 5 or 6. JMHO. The Halachik Problem with answering Amen at the end of Birchas Kohanim on this album would have been a shailah of Amen Yesoma which the Gemara discusses. One is not allowed to say Amen in vain. Being that this is a song for entertainment purposes and not the time for the prayer I would venture that it would be contraversial to do it. Fascinating. Sounds like a good enough reason to me. Thanks for sharing! Great Review !!!!!!!!!! I really enjoyed reading it! 2) in fort a yiddele .. notice how fried begins the stanza calling to the Rebbe with much more emphasis on the “fort” words indicating more hope. 3) Between Haderes and Tzi azoy you over looked a nigun. Wow, I guess I’ve established my credentials as a bona fida non-Lubovitcher with that “Rotz Katzvi” thing… Thanks for clearing that up! I’m going to suggest something crazy, let me know if you think I’m onto something, or I’m one of those conspirecy nuts who’s convinced that R’ Shmuel Brazil and Abish are totally stealing songs from B. Spears. 1) At the end of that Nigun we sing: Un Shoin. Let me explain: This Nigun reminds me of the old style Yiddish songs which some of them end with these 2 words. So that’s why I threw it in. 2)The reason I did not put in “amens” in the Birchas Kohanim was not so much for Halachik fears, but rather for taste reasons. I did entertain the thought and also to add room noise so as to give it a real feel, but at the end decided to keep it simple and not get carried away. The “kazoo” that someone wrote about is a harmonica. Meir: the similarity of High Note Nigun to the Sabre Dance is in the syncopation that I wrote about. From wikipedia: Syncopation includes a variety of rhythms which are in some way unexpected in that they deviate from the strict succession of regularly spaced strong and weak beats in a meter (pulse). These include a stress on a normally unstressed beat or a rest where one would normally be stressed. “If a part of the measure that is usually unstressed is accented, the rhythm is considered to be syncopated.” It’s a style – so I doubt it was modeled after the Sabre Dance. And, yes, you do hear the fluttering flute which is similar to that Bach piece that Avi plays in HASC; but again, I don’t know if Boruch Hu was davka influenced by it. I don’t see any other way to contact you ( the another of the review ) So this is not a comment necessarily, rather a question. I was wondering if you thought the same, and if you got some info on that, b/c when my friends and I listened to that the first time, we all turned around and said, WHAT?! that’s not how AF usually hits his high notes….. Otherwise I cant find any other “mistakes” in the CD… Sounds great! 1. Why did you tell the readers that they shouldn’t get a heart attack by listening to „fort a yidele“? What is there in the lyrics that might cause a heart attack? 2. Could you explain to me what „ober a ma’aleh, vider a ma’aleh“ means? I know that „ober“ means but and „vider“ means again, but what does ma’aleh mean in this context? 3. This is not a question, but a statement: I agree with you that in „Cry of the soul“ as well as in „Al Tira“ there seems to be a clash between deep and serious introspection on the one hand, and serenity on the other. They do not really fit together; but maybe he chose to put in the light, serene parts to leave the listener with a sense of comfort and light-heartedness. The fact that in both songs, the merry parts come after the serious ones, would speak for this argument. If you bother to read and respond to my message, I will thank you very much in advance. 1. I was afraid that people would think that Chabadniks pray to their Rebbe, rather than to G-d. The song is a parable, and should be taken as such. 2. In my opinion, the song is circular: the “ober a maaleh” is to say that, whatever the case, we have a quality; “vider a maaleh”, and another quality, which leads into the “even though/chotsh”… of the second part. Doch, doch, doch damsa lesamar – Still we are compared to a palm tree. Questions are always good, so don’t worry! Thank you so much for your patience and your translation of the lyrics. Now that I understand what he’s actually singing, it feels even better listening to the song. Are the lyrics in Aramaic? I have a last question before I’m silent: Where is the Al Tira passage taken from? What is its source? No prob! The words are Yiddish and Hebrew, the Hebrew taken from the Hoshanot prayers on Sukot. The Al Tira Yaakov lyrics are from a zemer that some people have the custom to sing on Motzei Shabbat. While I don’t know who composed it, the lines are taken – in alphabetical order – from pesukim that mention Yaakov’s name. You should be able to find it in bentchers. And we will have the Live DVD review up within a day, G-d willing. a really, really good album! The lyrics can be found in the liner notes, or in virtually any Chabad bentcher. the changed words.. ♪Chasidei Chabad anu…what? 2. Hoaderes is taken directly from the passage in the Shabbat morning prayers. 1. Ti Azoy Freilach Dart Mein Zain (If I heard correctly). 2. Tayere Brider Mir Vellen Zich Vaiter Zehn/Mit’n Rebbe’n B’ezras Hashem. Un Vos Du Darfst Vet Er Dir Gebben. 4. Di Velt ? Un Der Ikkar/Nisht Tzu ? Zich (What words come instead of question marks?). 3. Yankel, don’t have any fear! Just trust in the Creator! G-d will give you life, and whatever you need, He will give you! Sorry to come back to this so much later, but what do the words of Chassidei Chabad anu get changed to?